Microsoft's EA Versus CSP Licensing, Which Option is Better for Your Organization? Unfortunately, there is no single correct answer to the CSP vs. EA question, since it depends on your organization’s specific needs for quantities, products, and suitable term length. This can even be determined by your preference when dealing with IT partners or vendors. A combination of both may even work best for your organization. We'll explain the differences between Cloud Solution Provider (CSP) and Enterprise Agreement (EA) to help you determine the next best step for your organization. Before reviewing the CSP and EA options, you should know if your organization is currently using any of the Microsoft’s Cloud Online Services, such as Azure or Office 365, on a pay-as-you-go basis. This means that your organization is making direct payments to Microsoft, (probably by credit card), for your monthly Azure usage and subscriptions licenses your organization uses. This is likely a less than optimal option for you. This may only be a suitable option for your organization if you are doing initial research on Microsoft’s Online Services or you can handle the internal user requests and day-to-day IT issues. The drawback of the pay-as-you-go option is that your organization is not taking advantage of the discounts offered through CSP or EA. You are also missing out on the more attentive support services that a Microsoft Partner can deliver under their CSP program. and/or need a fixed price for software and subscription-based licensing for 3 years. What does the CSP Partner do for You? The CSP program is designed for certified Microsoft Partners to deliver Online Services to organizations in a flexible and consultative manner. The CSP model was designed by Microsoft so that your organization can have a closer relationship with a Microsoft Partner as your technology advisor. This partner, known as a CSP Partner, will own the relationship end-to-end, and support your organization when there are any questions or issues. The CSP Partner will work closely with your organization to identify the best Microsoft Online Services to implement for your users, which will ultimately drive and maximize the CSP value for your organization. Which CSP Partner Will Work Best for You? 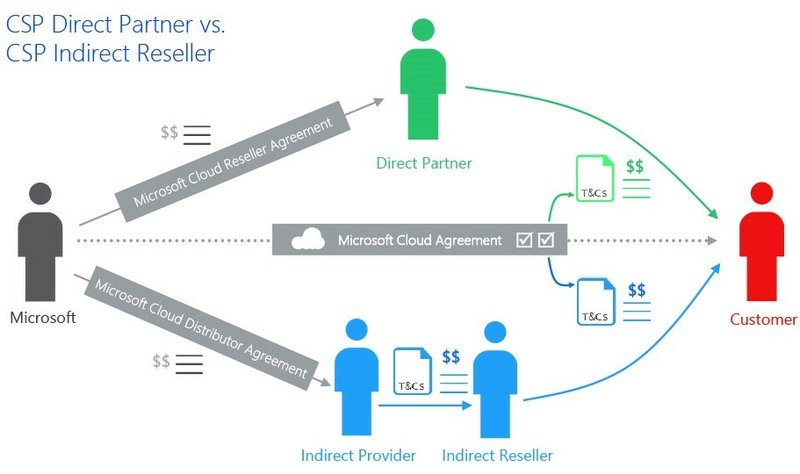 CSP Indirect Resellers – These partners work with a distributor to provide services to a client in a two-tier model, where the distributor ((called an Indirect Provider by Microsoft) provides the CSP Partner with billing, customer service, and technical support, as the partner focuses on selling solutions. Partners in this model are usually referred to as CSP Indirect Resellers or just CSP Resellers. CSP Direct Providers – These partners operate in a single tier model, where they can offer their own appropriate sales, billing, and support infrastructure. These partners “directly” bill their clients, and are usually more mature as a registered and certified partner with Microsoft competencies in various technologies (usually designated with Silver or Gold) and can implement solutions and support on their own. Partners in this model are usually referred to as CSP Direct Partners. The CSP option works best for organizations that want to consume Microsoft Online Services in a predictable and controlled manner, where they can closely assess and adjust their consumption on a monthly basis. Organizations seeking a trusted adviser and partner to guide them through implementing projects while managing their cloud accounts and subscriptions should be invested in CSP Partners like American Technology Services (ATS). There's no one-size-fits-all option that fits all organizations. We will work closely with you to study the EA and CSP features so that you can have a better understanding of the benefits and drawbacks of each option. ATS is a CSP Direct Partner with Gold competencies in Cloud Platforms (Azure) and Cloud Productivity (Office 365 and Microsoft 365). Alex has more than 25 years of experience in software development, networking, and computer operations. As part of American Technology Services' management team, he has been responsible for building the managed hosting business and leading the web design and development services for the past 14 years.